Lately, we’ve have quite a few vehicles come through the shop with fuel pumps that have failed. This seems to go in cycles, where we see a lot of one particular thing coming in all the time and this time of year seems to be fuel pump problems. The colder weather can have a lot to do with these failing, but other than that, it’s really a random occurrence. Being an electrical component, people sometimes don’t understand that they can go out for no reason at all. Ever try to guess when a light bulb will fail? It’s about the same with a fuel pump, it can go out anywhere, anytime! Today I had a Chevrolet Avalanche that was towed in as a no start. After some diagnosis in the parking lot, I could quickly tell that the truck was getting no fuel. Also, the battery was dead, so that wasn’t a help, but I did get the truck started on some starting fluid which I sprayed into the throttle body. I knew then that the vehicle did in fact run and I didn’t have an ignition problem or mechanical failure. I quoted the job for the service writer and he promptly sold it. A good thing with a vehicle that doesn’t start, the customer pretty much has to get it fixed if they want to drive their car. I got my parts that were needed and dropped the fuel tank out of the truck. These types of jobs really aren’t that difficult, as most of the work is pretty straight forward. You have to remove the filler neck hose and vent hose, the EVAP canister and related parts, the fuel lines, electrical connectors and fuel tank straps. The tank is dropped down by using a transmission jack and then set on the floor to change out the pump assembly. This particular Avalanche had a lot of miles and was quite rusty underneath. This usually doesn’t help the situation and just makes things more difficult to loosen and take apart. The two fuel lines were extremely rusty coming out of the pump and required replacement as well. After changing out the pump assembly, installing new fuel lines, and getting everything back together on the tank, it was lifted back up into place. Everything else was hooked up and the vehicle was fired up just like new! Jobs like this are expensive, and especially using factory parts, but it is well worth the expense to fix it right the first time rather than have to do it again because of a failed aftermarket part. The customer was happy to get their vehicle back the same day, running great! 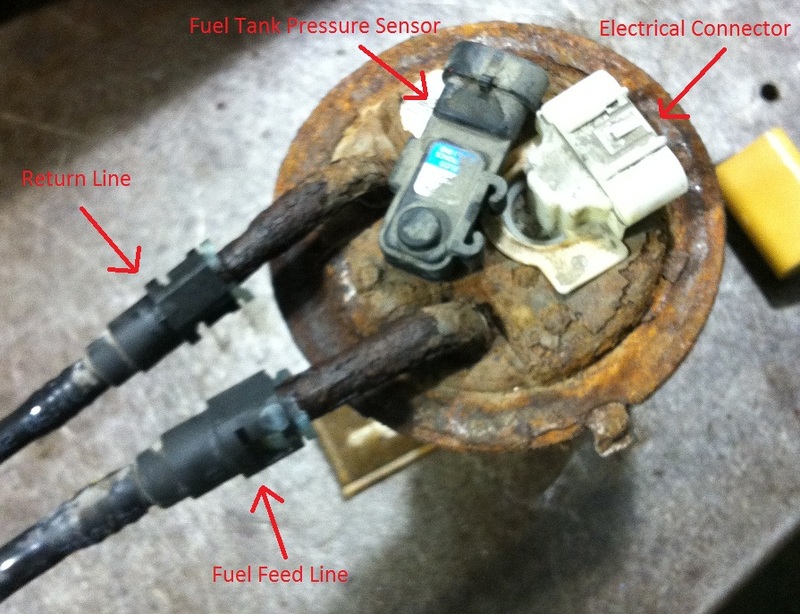 Below, I’ve included two pictures of the fuel pump I changed, along with some diagrams/names of the components that make up the fuel pump assembly. You can see how rusty the fuel lines were on the top of the pump. Take a good look and learn what the parts are. Knowledge is always a good thing, and if you ever have to have your fuel pump replaced, you will know a little more about the job and the part itself! Truck will not start on the first turn of the key. Will usually start on the second try. I have changed the fuel pressure regulator, o ring set on the fuel injectors. I checked for parts leaking before I replaced the plenum. No leaks……. I also changed the cap and rotor. Truck still misses and backfires at times. Any suggestions? Is the hard starting more when the truck or outside temperature is cold or warm, or does not matter. Is this happening only on the first start fo the day? Tempeture does not make a difference. Will happen after the first start of also. OK. You are on the right track with the thinking this is a fuel problem. You need to check fuel pressure next when it is acting up. Have a gauge on the pressure tap on the engine, then just turn the key ON and watch the pressure closely. Best to do with two people. What pressure am I looking for? and should it be consistent? Would a fuel problem cause the backfire? This Vortec V6 needs to be at least 55 PSI and not drop below that. Even a few pounds below that, it will not start. It should go upo to at least that, better if a fee pounds over that. If it is a little low, turn the key off for 5 seconds, then try it again. If it now goes up to a little higher pressure, then you have a bad fuel pump. I will check this out. And get back to you with the results………. Thanks for your help! 7 Comments on "Bad Fuel Pumps Cause Vehicle To Not Start"
I have a 2002 chevy trailblazer 4.2 fuel pump went out replaced the fuel pump still not start it cranks over. Figured out it was a bad pump so replaced it again, still the same problem, went to wrecking yard got a used pump cranked the engine while the pump was out of tank to make sure it was getting electrical connection works great put the pump in the tank put every thing back hooked up every thing went to start will not start the fuel pump quit working again. I am frustrated as to why it wont start after putting everything back together. I need Help to understand what is happening. Obviously the fuel pump is working. Do you know if the engine has spark and fuel injector pulse signal? I replaced a bad fuel pump about 8 weeks ago and the new one just failed. I noticed that both times the battery has died along with fuel pump. I am looking for a solution and wondering what would be the next step to trying to find out the issue. Can some one give me some ideas? I wish it was that easy, no problem with baertty, turns over great. It’s just that when you turn the key on you should get dash lights & hear your fuel pump run for approx. 2 seconds, before it starts up & that ain’t happening. I’m starting to hear nasty words like there could be a broken wire in the wiring harness of the steering column.. And I do not like hearing that. Has anybody else had this Problem??????? What if we changed our the fuel pump but it still wont come on nor will the truck start. What could that be? Then you need to check for power and ground at at the fuel pump connector next. 01 Olds intrigue bad right side exhaust air check valve what is the best way to replace don’t look easy to get to bolts. Any easy way out?